She has enjoyed four months of wedded bliss with Nick Jonas so far. And Priyanka Chopra doesn't believe that his ex Miley Cyrus will come into their relationship like a Wrecking Ball. The 36-year-old actress appeared on Watch What Happens Live With Andy Cohen on Thursday night as she revealed that she wants to have a double date with the 26-year-old daughter of Billy Ray Cyrus. When asked if she’d ever double date with the Malibu hitmaker, Priyanka replied: 'We actually talked about that, doing a double date at some point. It was fun. The Quantico actress met Miley after she starred with Liam in the comedy movie Isn’t It Romantic, which premiered in February. 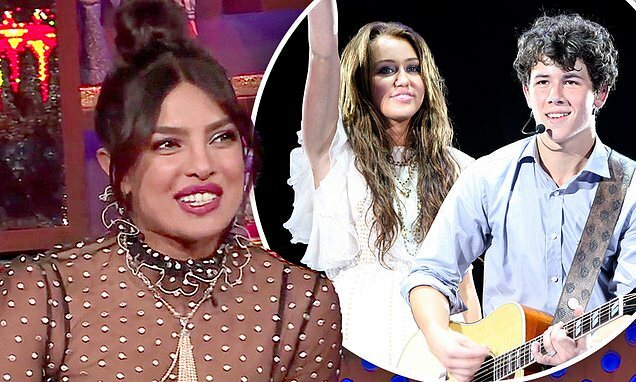 Priyanka said the singer 'showed so much support to Liam and the movie while we were doing promo,' and says she's even a 'fan' of Miley's music.